Schenectady County is a county located in the U.S. state of New York. As of the 2010 census, the population was 154,727. It is part of the Albany-Schenectady-Troy Metropolitan Statistical Area. The county seat is Schenectady. The name is from a Mohawk Indian word meaning "on the other side of the pine lands" and is pronounced /skəˈnɛktədi/. Schenectady County was formed in 1809. 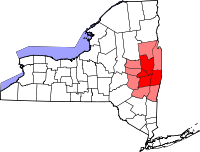 When counties were established in New York in 1683, the present Schenectady County was included in Albany County. Albany County was an enormous county, including the northern part of New York State as well as all of the present State of Vermont and, in theory, extending westward to the Pacific Ocean. This county was reduced in size on July 3, 1766, by the creation of Cumberland County, and further on March 16, 1770, by the creation of Gloucester County, both containing territory now in Vermont. On March 12, 1772, Albany County was divided into the counties of Albany, Tryon (now Montgomery), and Charlotte (now Washington). Albany County was reduced in size in 1786 by the splitting off of Columbia County; again in 1791 by the splitting off of Rensselaer and Saratoga Counties and the transfer of the Town of Cambridge to Washington County. It was further reduced in size in 1795 by the splitting off of a part that was combined with a portion of Otsego County to create Schoharie County. It was further reduced in size in 1800 by the splitting off of a part that was combined with a portion of Ulster County to create Greene County. In 1809, Schenectady County was split from Albany County. Schenectady County is located in east central New York State, north of Albany. According to the U.S. Census Bureau, the county has a total area of 543 km² (210 sq mi). 534 km² (206 sq mi) of it is land and 9 km² (4 sq mi) of it (1.68%) is water. Unlike many of the upstate New York counties, Schenectady County is small in area. As of the census of 2000, there were 146,555 people, 59,684 households, and 38,018 families residing in the county. The population density was 275/km² (711/sq mi). There were 65,032 housing units at an average density of 122/km² (316/sq mi). The racial makeup of the county was 87.77% White, 6.79% Black or African American, 0.23% Native American, 1.97% Asian, 0.03% Pacific Islander, 1.21% from other races, and 2.00% from two or more races. 3.17% of the population were Hispanic or Latino of any race. 22.3% were of Italian, 13.7% Irish, 10.7% German, 8.4% Polish and 7.0% English ancestry according to Census 2000 . 90.6% spoke English, 2.7% Spanish and 2.1% Italian as their first language. There were 59,684 households out of which 30.00% had children under the age of 18 living with them, 47.50% were married couples living together, 12.30% had a female householder with no husband present, and 36.30% were non-families. 30.60% of all households were made up of individuals and 12.60% had someone living alone who was 65 years of age or older. The average household size was 2.38 and the average family size was 2.97. In the county the population was spread out with 24.30% under the age of 18, 7.90% from 18 to 24, 28.10% from 25 to 44, 23.00% from 45 to 64, and 16.60% who were 65 years of age or older. The median age was 39 years. For every 100 females there were 92.60 males. For every 100 females age 18 and over, there were 88.30 males. The median income for a household in the county was $41,739, and the median income for a family was $45,670. Males had a median income of $38,840 versus $27,339 for females. The per capita income for the county was $21,992. About 7.80% of families and 10.90% of the population were below the poverty line, including 15.70% of those under age 18 and 6.50% of those age 65 or over. The county operates the Schenectady County Public Library that consists of a central library and nine branches. Yates, Austin A. (1902). Schenectady County, New York: Its History to the Close of the Nineteenth Century. the New York History Company. http://www.schenectadyhistory.org/resources/yates/index.html. Lockhart, Charlotte (1921). Family Bible Records of Schenectady County. Unknown. http://shenectadycountygenealogyrecords.blogspot.com. This page uses content from the English language Wikipedia. The original content was at Schenectady County, New York. The list of authors can be seen in the page history. As with this Familypedia wiki, the content of Wikipedia is available under the Creative Commons License.